Moses is given credit for authoring the first five books of the Old Testament. These books cover the history of the Hebrew people, spanning from their earliest ancestor Adam, down through their experiences as slaves in Egypt, their exodus from Goshen, and their wanderings during the 40 years before they entered Canaan, the promised land. In actuality, the Hebrews as a people originate with Abraham. God called Abraham who was living in Ur of the Chaldees and told him to leave his home and to go where he (God) would send him. Abraham obeyed, taking his household and leaving his father and relatives behind. God led him from place to place, and during his wanderings Abraham received the promise from God that his posterity would become a great nation, and that through him all families of the earth would be blessed. Abraham and his wife had no children and the wife was past the age of childbearing, so this was surely hard to believe, but Abraham had faith. He trusted God implicitly. His wife lacked the faith that her husband had. She knew she couldn’t have a child at her age, so she thought, “Well, I’ll just give my servant woman to my husband to have a son, and I’ll take her son for my own, and that way the plan of God can proceed.” This type of polygamous arrangement was common in those times; Abraham agreed; the servant woman did indeed bear a child, a son named Ishmael. The Muslims are descendants of Abraham and this servant woman. If that is shocking to you, look it up. 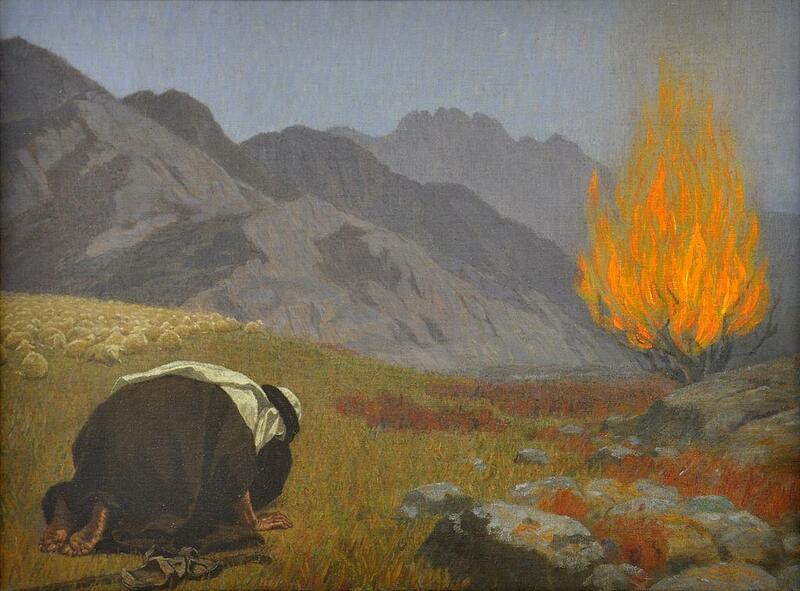 It is a fact that Muslims claim descent from Abraham through Ishmael. Eventually an entourage from heaven visited Abraham and Sara, and told them God’s promise was about to be fulfilled; they were going to have the son God had promised long ago. Sara, ever the skeptic, laughed at the idea. However, within a year Sara herself bore Isaac. Fast forward, and Isaac has two sons, twins: Esau, the firstborn and Jacob, the usurper. Though Esau, being first, would normally have inherited at his father’s death the best of his father’s goods and his deathbed blessings, which carried tremendous import for good, Esau obtained neither. This was partly his fault, for in a rash moment he had earlier granted his birthright to his brother Jacob. It was partly Jacob’s doing since shortly before his father’s death, he disguised himself as Esau and tricked his blind and aged father into pronouncing upon him the blessing reserved for the firstborn. Jacob eventually got it right, and God prospered him. He had twelve sons. One of these was Joseph whose eleven brothers for jealousy sold into slavery and then led their father to believe a wild animal had killed him. Joseph rose from slavery to become prime minister of Egypt, second only to Pharaoh. During a time of famine, when there was no food in the land, Jacob sent some of his sons to Egypt to buy grain. There to their surprise they found Joseph and were reunited with him, who had already forgiven them. 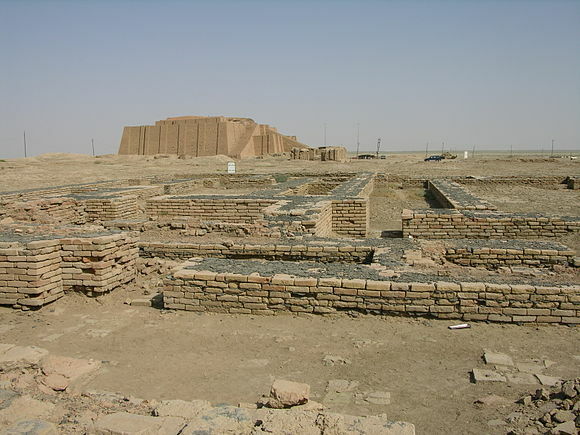 Due to the famine, Jacob and his entire household, flocks, goods, and everything relocated to the land of Goshen in Egypt. Because of Joseph’s high position they were treated very well by the Egyptians. For four hundred years the sons of Jacob lived in Egypt. The favor they had known gradually eroded away as new rulers took their places. Time came when Joseph was forgotten, and the Hebrews began to be hated. They eventually became slaves and were treated very harshly by the Egyptians who apparently believed subjugation was the preventive for insurrection. The Egyptians felt threatened by the Hebrews, for they had multiplied to be a vast horde of individuals. Moses and his brother Aaron went to Egypt as God directed and petitioned Pharaoh to let the Hebrews go free, but Pharaoh was not of a mind to do so. Over a period of time Moses continued to press Pharaoh for his people’s freedom, but repeatedly Pharaoh stubbornly rejected his pleas. In retaliation God struck the Egyptians with plagues ten times. The afflictions, increasing in intensity from first to tenth, began when God had Aaron to raise his staff over the Nile River, turning it to blood for a week. The next was a plague of frogs which came up out of the river and overran the country. The women even found them in their bread bowls! Pharaoh was so distressed by the frogs that he begged Moses to send them away and promised to let the Hebrews go. The frogs had no sooner gone than Pharaoh changed his mind, as he was to do in several succeeding instances. Lice, flies, pestilence, boils, hail, locusts, all were endured by the Egyptians while their Hebrew neighbors in Goshen were not affected. After the ninth plague, which consisted of three days of intense darkness in Egypt Pharaoh told Moses that if the Hebrews left behind their cattle, they could go. Moses refused to negotiate. It was now that God purposed to deal with the Egyptians with a heavy hand. The tenth and final plague would be the death of the firstborn of both people and cattle. This time the Hebrews had to do something to prevent the Lord from killing the firstborn in their households. An unblemished lamb was to be killed and its blood applied to the doorpost and lintel of each house, its flesh roasted and eaten and its bones and any uneaten portions burned in the fire. The blood on the doorposts was the sign for the Lord to pass over that house so the firstborn within would be spared. Here is the origin of the Jewish Passover. The night of the tenth plague a great wailing was heard in Egypt as the firstborn in every Egyptian family had died. It has been suggested that perhaps some of the Egyptians escaped the tenth and final plague by following the instructions God had given the Hebrews. They certainly had seen the hand of God move nine times already and had noticed the Hebrews had not suffered from the plagues. Just a thought, someone else’s, that I am repeating. During the night of the Lord’s pass over Pharaoh sent for Moses and told him to take his people and “Go!” This time he meant it, for the Egyptians now feared for their lives. Before the Hebrews departed the Egyptians gave them valuable articles of silver, gold, and clothing. 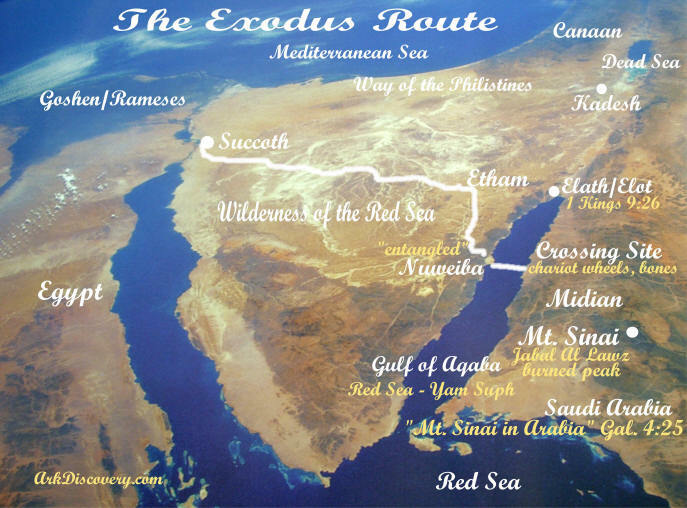 The route of the exodus of the Hebrew people from Egypt has been a controversial subject in the past because the route suggested by many scholars just did not match up with the Biblical narrative. Today, more than ever before, we are finding that the Biblical narrative, not just in the case of the exodus, but in every case, is accurate, and it is our perception that needs to be adjusted. We need just a bit more information, a little archaeological discovery, and the pieces of the puzzle fall into place. For an accurate description of the route the Hebrews took to the Red Sea crossing check out the fairly recent discoveries of Ron Wyatt. The evidence uncovered by Mr. Wyatt is astonishing and proves the Biblical narrative beyond doubt. Here is a map from the website: arkdiscovery.com where you can get additional information. This is Part One of what I expect will be a two part article.